Problem: Ok not really a problem, but I want to be able to launch Google Chrome straight to Incognito mode from a shortcut. This is useful when logging into multiple bank accounts, Google Apps accounts, or testing session based websites. etc etc etc. Note: –args has to be passed to satisfy the ‘open’ command’s arguments first. 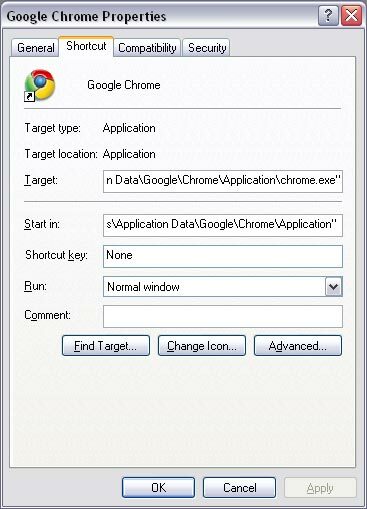 do script "open -a /Applications/Google\ Chrome.app --args --incognito;"
Note: The space in the Google Chrome.app name must be double-escaped with two backslashes like that to work. Also, without the delay I found that the script exits too quickly or something like that, and it doesn’t work. 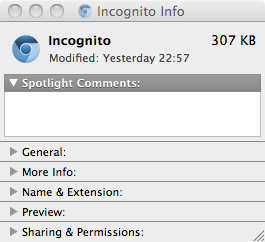 Save the above script as an Application, and call it something like ‘Incognito’. Running this app will launch Terminal, Chrome Incognito, then exit Terminal. Bingo! Open the image you want to use as the icon – it should be a 512×512 24bit PNG if possible – and copy the image to the clipboard. If you are using Preview to view the image, do cmd+a to select all, then cmd+c to copy it… this works for most other graphics packages also. Locate the app you created above in Finder, then press cmd+i to bring up the info window (alternatively right-click the app then select ‘get info’). Close the info window, and it’s done. You should now have a nice looking shortcut that opens Chrome Incognito with one or two clicks! Niggle: I use Google Chrome’s Incognito window mode regularly to view multiple Google Analytics accounts at the same time on one PC. It’s very useful – it means I don’t have to keep signing in and out of my primary google account – but what annoyed me each time was having to open chrome, then open a new ‘incognito’ window from there, which leaves the old ‘normal’ window open in the background. Solution: Since Chrome came out of beta, the ‘−−incognito’ command line switch has been available. Copy the existing Chrome shortcut in your quicklaunch bar, desktop, or start menu. 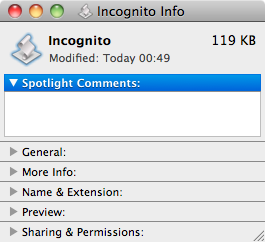 Rename the shortcut to something obvious, I called mine “Chrome Incognito”. Right click on the shortcut, and select ‘properties’. Click ‘OK’ to save your changes. There, all done, that shortcut will now open Chrome in incognito mode window. If you have other normal chrome windows open, they will not be effected by this window. For example, you can stay logged into a google account, a live account, or any other persistent cookie/session driven system. Incognito windows are also great for logging into online banking sites if you’re a bit paranoid. Note: If you have a 0. * version you will need to upgrade to v1. * or higher.